Here at Hot Ground Gym, we’re proud of the many different types of obstacles that we’ve created at our Vernon Hills location. Which is kind of a funny thing to say, because most businesses out there are trying to make your life easier by removing obstacles. There are technology solutions, business solutions, inventory solutions. And here we are slowing people down! Well, that’s what obstacles do, and we’re better because of them. 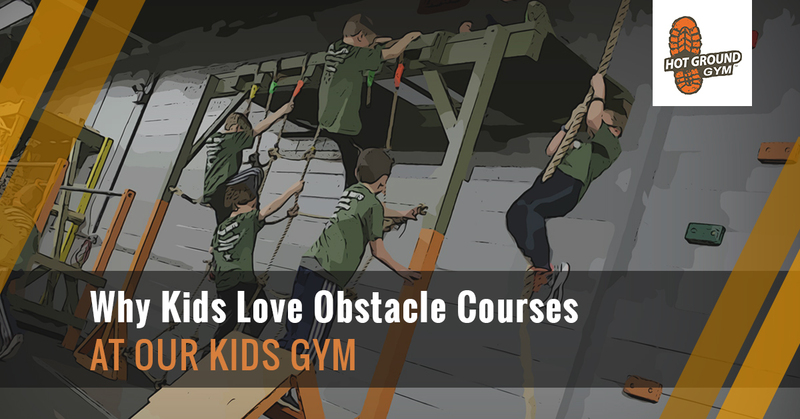 Our American Ninja Warrior-style obstacle courses are perfect for our kids fitness programs and also work as an amazing kids’ birthday party venue. We bring kids together so that they can physically surmount the obstacles, sure, but we’re also interested in them using teamwork and problem-solving skills to find themselves better on the other side. Let’s investigate these a little bit more. School playgrounds, public parks, McDonald’s Playplaces…they all have something to climb. For some reason kids (and many adults) love to climb, whether it’s to become “king of the hill” or simply to get a better view. Who knows, it could go back to ancient times where cities on hills had a more easily defensible position. After all, you can’t roll boulders uphill at people! One of the most important lessons in life that kids can learn is the importance of teamwork. Sure, it’s important to be self-reliant, but no one can do everything on their own. In fact, we can create obstacles in our kids’ gym that can’t be solved without the help of teammates. The founders of Hot Ground Gym are military veterans, and they fully realize that going into a situation alone can be deadly. While the stakes might not be so high at our gym for kids, learning how to work as a team now can help kids in all future activities. A human without obstacles quickly becomes bored, so much so that they can end up creating problems in their lives to give them something to solve. We need mental stimulation and have the desire to figure problems out, and we get a rush associated with accomplishment. After all, someone with no obstacles will never have a feeling of accomplishment, and that makes for a sad human. Of course, obstacles also make us better at adapting to future problems. When we figure out one obstacle, that makes us more ready for the next one. Knowledge can be taught, but wisdom is a combination of experiences that we learn from because we’ve experienced and overcome them. At Hot Ground Gym, we’re going to get in your kid’s way! Well, at any rate, we’re going to put an obstacle course in their path so that they can find the best way through using their brains, bodies, and social skills. Learn more about our programs today!